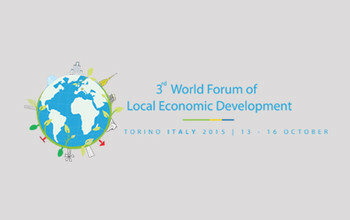 The 3rd World Forum on Local Economic Development will be celebrated in Turin (Italy) from 15 to 18 October 2015. The event is organized by the Municipality and Province of Turin, the global network of United Cities and Local Governments (UCLG) and its Committee on Local Economic Development, through the Andalusian Fund of Municipalities for International Solidarity (FAMSI), the Organization of United Regions (ORU FOGAR), the Brazilian Service of Support for Micro and Small Enterprises (SEBRAE), the International Labour Organization (ILO) and the United Nations Development Programme (UNDP). Considering the new post 2015 agenda, which will define the development framework of the next 15 years, Local Economic Development (LED) is suggested as a means for implementing the future agenda at the local level and inform a revised global economic governance structure. 1. Regional competitiveness and innovation for sustainable and inclusive development. 2. Towards local inclusive growth and jobs. 3. LED strategies for creating positive urban rural linkages. LED, understood as a strategically planned, locally driven partnership approach to enable employment growth, poverty reduction and quality of life gains through improved local economic governance, is a tool that can further strive for a more inclusive and equal development, by including all territorial actors representing private, public and civil society sectors. During the 3rd Forum, the results of the harmonization process of local economic development approach, envisioned in the Plan of Action adopted in the Final Declaration of the second Forum will be presented. The strategic emphasis will be given to practices and instruments that have been able to integrate the urban and rural dimension into the territorial strategies, as well as the three sustainable development components namely, social economic and environmental.